Lansing, MI and Santa Clara, CA - May 13, 2010 - California-based Milestone Internet Marketing and American Hotel & Lodging Educational Institute (EI) announced today the release of the third edition of From Hotels to HTMLs™: A Complete Guide to Internet Marketing for the Lodging Industry, authored by internet marketing experts Benu and Anil Aggarwal, and printed and distributed by AH&LEI. "It is with great excitement that we introduce the third edition of our Hotels to HTMLs book. We printed the first edition back in 2003 and so much has changed since then that if you were to go into a slumber in 2003 and wake up today, you'd find it hard to understand all the complexities associated with the internet space today," states Benu Aggarwal, Milestone President and Co-author of the book. "In the fast-paced evolution of the internet, this book gets the adrenaline going and offers new opportunities for hoteliers to excel in this dynamic marketspace." This one-of-a-kind book offers practical, proven information for hotel professionals on all aspects of internet marketing, which hoteliers can use to improve their revenue and internet presence. All the strategies illustrated - from traditional search engine marketing to mobile, social media, e-mail, and website optimization - have been successfully deployed to create good return on investment for different hotels in Milestone's portfolio. The content is based on the authors' experiences working with more than 800 hotels to provide them with increased revenue through effective internet marketing. For hoteliers who don't know RSS from SEO, the book provides practical tips in easy-to-understand language, and offers nearly a dozen handy checklists to monitor a property's internet marketing progress. There are checklists for website design, social media optimization, e-mail marketing, ROI tracking, pay-per-click, and website analysis. "Our objective is that the reader walks away with productive, real-life strategies to enhance their hotel business by utilizing the internet," Benu concludes. 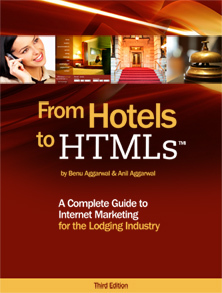 From Hotels to HTMLs™: A Complete Guide to Internet Marketing for the Lodging Industry is available for $40.95 for AH&LA members and $47.95 for non-members, and can be purchased from either EI (www.ahlei.org) or Milestone Internet Marketing (https://secure.milestoneinternet.com/hotelstohtmls/hotel-marketing-publications-print.aspx). The book is authored by principals of Milestone Internet Marketing, an award winning provider of internet marketing services to the lodging industry. Benu Aggarwal is the Founder and President of Milestone and is the key driver for technology and strategies deployed by Milestone to increase revenues for its clients. CEO Anil Aggarwal brings significant technical and marketing management experience and ability to organize technology and strategies in a cohesive, well productized form. Established in 1953 as a nonprofit educational foundation of the American Hotel & Lodging Association, the Educational Institute's mission is to support AH&LA by becoming the preferred provider to the lodging industry, hospitality schools, and related hospitality industries both domestically and internationally by developing and providing quality resources to train, educate, and certify hospitality professionals. Milestone Internet Marketing, Inc. is a leading provider of internet marketing solutions for the lodging industry. Milestone's portfolio of services includes Website Design, Search Engine Optimization, Pay-per-Click Marketing, Email Marketing, Hotel Internet Marketing, Hotel Website Design, and several Web 2.0 initiatives like Online Videos, Blogs, RSS, etc. Milestone currently works with over 800 hotels and drives over $250M in annual revenue for its clients. Milestone is a preferred vendor for several major lodging industry brands and works with the leading management companies in the US. Milestone is also well known as a lodging industry educator for its Hotels to HTMLs book and internet marketing workshops.